2018 drilling program a total success, expanding the size of the McKenzie Break deposit and confirming its high-grade potential. 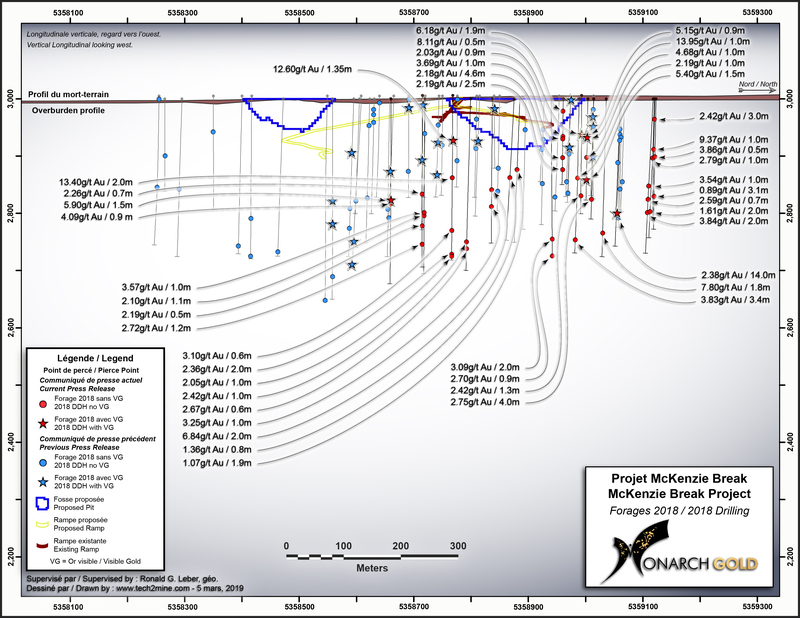 MONTREAL, March 20, 2019 /CNW/ - MONARCH GOLD CORPORATION ("Monarch" or the "Corporation") (TSX: MQR) (OTCMKTS: MRQRF) (FRANKFURT: MR7) is pleased to report the third and last set of assay results from the 2018 diamond drilling program at its wholly owned McKenzie Break gold project 25 kilometres north of Val-d'Or, near its Camflo and Beacon mills. The program started in September 2018 and ended in December 2018, with a total of 13,945 metres drilled in 61 holes. The purpose of the program was to explore below the known lenses and on the periphery of the multi-vein Green and Orange zones. Assays have been received for the last 20 holes totalling 5,052 metres of core (see table below and press releases dated February 28, 2019 and March 13, 2019 for a compilation of the 2018 assay results). "With the solid high-grade results obtained from our 2018 drilling program, we have upgraded the status of McKenzie Break as one of our prime advanced exploration projects," said Jean-Marc Lacoste, President and Chief Executive Officer of Monarch. "The program delivered beyond our expectations, enabling us to establish that the deposit remains open to the west, east, north and at depth and continues to hold excellent high-grade gold potential (see plan view and longitudinal). In fact, the next resource estimate has the potential to expand the underground deposit by 250 metres to the east, 100 metres to the north and 50 metres to the west. There is still a lot of exploration work to be done to fully assess the size and magnitude of this deposit, which remains largely underexplored. We are presently analyzing the results of the 2018 drilling and planning the follow-up program for 2019." Hole MK-18-236 returned 12.60 g/t Au over 1.35 metres, including 55.90 g/t Au over 0.3 metre at 80 metres below surface. This interval is 65 metres southeast of hole MK-18-210, which returned a grade of 12.50 g/t Au over half a metre from the same horizon as hole MK-18-236, thereby extending the lens to the east and showing that it is still open. Hole MK-18-236 also intersected another lens, at a depth of 145 metres from surface, with values of 13.40 g/t Au over 2.0 metres, including 26.40 g/t Au over 1.0 metre, and 75 metres north, on the same horizon, hole MK-18-232 returned values of 6.84 g/t Au over 2.0 metres, including 13.65 g/t Au over 1.0 metre. These two intersections are connected by hole MK-18-211, 100 metres northwest of hole MK-18-236. The combination of these three holes on the same horizon will increase the underground resource in this sector. 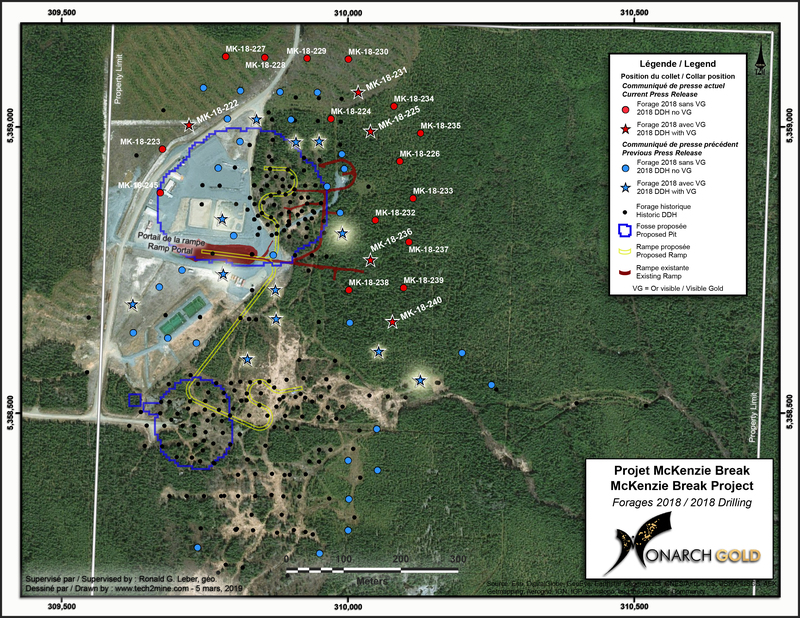 Hole MK-18-231, which returned a grade of 15.74 g/t Au over 1.5 metres, is to the north of the planned Green Zone open pit, in the middle of a triangle of three holes drilled by Monarch in 2018. These four holes are interpreted as being connected and are on the same horizon, creating a new lens. The three other holes are an average of 65 metres from hole MK-18-231 and grade an average of 5.42 g/t Au. The lens lies 200 metres below surface. Hole MK-18-222 returned a grade of 13.95 g/t Au over 1.0 metre from 68 metres below surface. This intersection is 70 metres northwest of the Green Zone open pit and will help to increase the underground resource.